Help us make our crazy redstone devices! Your donations will go towards upgrading and maintaining our servers. Sponsor: Make any donation, and you will be listed as a Sponsor. If you are a member, your name will be green on the server. So far, we have raised over $250! This has allowed us to purchase a significantly more powerful server. Thank you to all our wonderful donators! It is our goal to push the boundaries of what is possible with redstone engineering to it's breaking point and beyond. Computers, displays, vaults, minecart systems, mini-games, and anything else that involves redstone technology. The RDF is a symbol of quality engineering and ingenuity. When the Minecraft community sees a project with the RDF name, they should know that they are about to see something incredible. Disclaimer: All projects created by members of the RDF are owned entirely by their respective creator(s). Help cure Alzheimer's by joining our [email protected] team: 210389! There are no limits for those that see no limits. This should be in the Beta server forum. Actually, it should be in the Clan forum. My apologies for posting in the wrong section. I was thinking that, but wasn't sure if that's what you were going for, specifically. I would love to join the RDF, however I am not very good with redstone. However, I am skilled at making small cannons. Thank you, but at the current time we're still setting everything up. Once our Charter is posted and things begin to unfold, then we'll begin to see about accepting members. Also, you might want to get a bit more experience around the forums, as this is apparently your first post. However, if you would list your experience and such, we'd be more than happy to take it into consideration, if not actively evaluating. You can check out my sig for my youtube channel. You'd need to ask Berick on the internals of the TV, I'm mostly computer logic and the like. But his is a full-motion 21x21 display. Thank you for putting in your notice of wanting to join, once we get a bit more of a firm grounding we'll be more than happy to mull it over! Shrogg: Thanks for your interest in joining! As blue said, we have only just been established, so we are taking it slow on the recruiting until we get everything settled a bit, but I was impressed by some of the devices on your Youtube channel. Also, I ran a search for thejessassins display, but couldn't find it. Do you have a link? No i dont have any evidence proving it, because he thought it was too inefficient (i think, so dont quote me on that one) but he built a simple example on my server to show me. so I'm not accusing you of stealing the idea, as i don't think it was released publicly. its 16 bytes, with 8bit bytes, its all adressible from the main hub. Also, Shrogg, could you explain your design in depth a bit more? Or, barring that, send us a schematic of it so we can poke with it a bit? Of course, if it's still on a server, it'd be nice if we could pop on and look under the hood. I would love to help with any projects you guys are working on. While I haven't built anything nearly as complex as the display or pacman game, I feel like I am pretty good with building some mediocre structures with redstone. I would have to say my specialty would be in creating rail systems as that is what I have spent the most time on, both as a checkpoint system in my puzzle map and in the creation of my subway system. While they only contain fairly simplistic contraptions, the two maps in my signature show off some of what I have done. I would have to say my greatest redstone accomplishment at this time is creating the musical trap in my puzzle map. Unfortunately, I do not have any screen shots of this but if you play the map you can check it out for yourselves, which I'm sure is easier for you anyways. We're still setting up and getting all our ducks in a row, but once we're off and rolling we'd be more than happy to look at your projects. We'll keep ya posted. 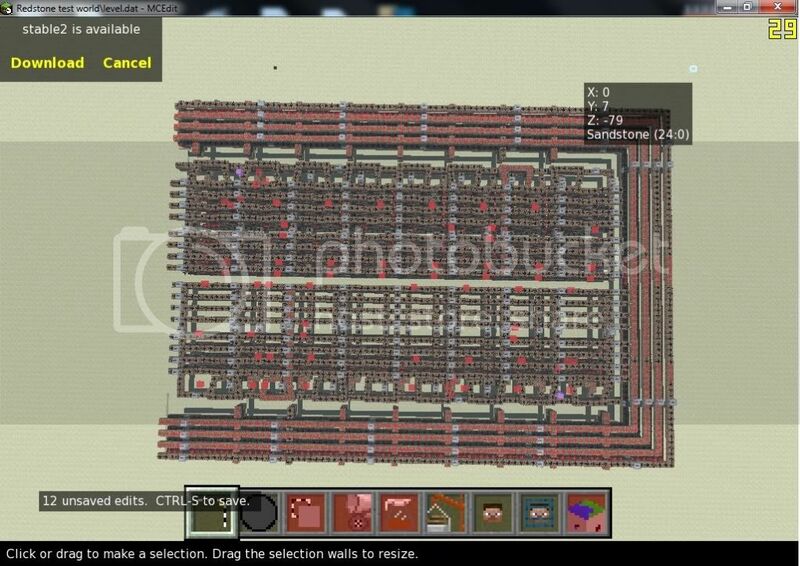 I see what you did there, and i can send you a .schematic file if you want (this is going to be included in my redstone computer creators pack) i just need to finish off the last 8 bits with their decoder then its done. im probably going to compress it tonight (possibly putting the decoder on the top?). Hey, sweet action! If you don't mind, send it through our IRC channel to Berick, so he can load it in. charmon21: I'm looking forward to taking a look at your creations when I get the chance. They sound pretty cool. Also, nice job on your signature banners! Shrogg: As a courtesy, I won't upload your schematic onto our experiment server until you've become a member. I will take a look at it on my own world though. Speaking of, please see the updated membership section in the first post to begin your recruitment process. I'm looking forward to working with you both. Hello all! I would like to announce our shiny new Charter is available for your perusal! This document has the core ruleset that tells how we run this shindig, if not the actual runnings, to be frustratingly obtuse. In any case, please feel free to familiarize yourselves with it, it's how we do business. Give or take a few amendments. Everyone, I'd like to welcome our first new member to the RDF: Charmon21! He impressed us with his professional manner, ability to learn, and drive to experiment with projects that are beyond his current capability. We look forward to building with you Charmon21! Forever a Troll: Glad you like Mineman! :biggrin.gif: You sound like you have a pretty good grasp of redstone tech, and modders (especially mods related to condensing down redstone circuitry) are definitely something we are looking for. I look forward to speaking with you on IRC!